Swapping-out The R180 In The 240Z - For An Open R200. Installing an R200 differential from the 280Z, 280ZX or first generation 300ZX in the Datsun 240Z is a popular and easy swap. Some of the most common questions are answered here. Question: What are all the parts I need, in addition to the R200 differential itself? Answer: All parts below should come from a 280Z that has the R200 installed at the factory. Mustache Bars: See Item #2 in drawing above. There are three different types of mustache bars used in the 240/260/280Z's. The early Z cars used a flat mustache bar (70/71), when the rear end was moved further rearward with the beginning of the 72 production run, the mustache bar was offset rearward and could thus be described as having an offset. The mustache bar for the R200 found in the 280Z's was further offset by moving the mounting points on the subframe rearward, it is stronger and had larger holes for mounting the R200's larger mounting studs. 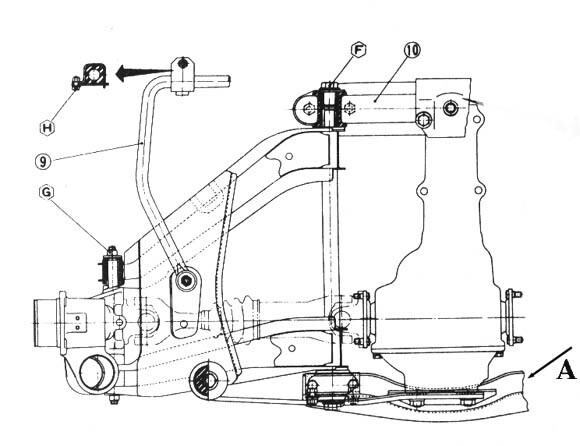 The R180 and R200 use different front differential case mounts & insulators (see #9 and #10 in drawing above). So it is best and easiest to grab the front mount and insulator, along with the other two parts above (Mustache Bar & Rear Transverse Link Mount) out of a 280Z equipped with the R200. 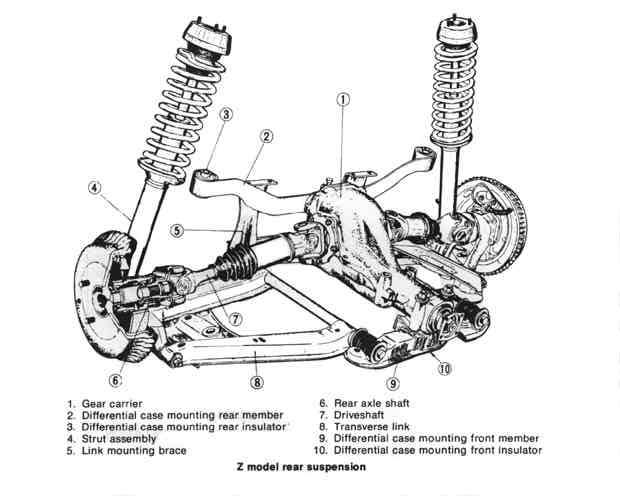 (Not visible in drawing above - see images below:) The rear transverse link mount runs under the rear of the differential and ties to two lower transverse links (see item #8 in drawing above) i.e. the right & left side, together. Two vertical plates run up from it and bolt to the rear subframe (see #5 in drawing above). There are two types used in the first generation Z's. The 280Z's equipped with the R200 use a transverse link that has a downward curve in it, thus allowing more room for the larger R200. The transverse link mount used in Z's equipped with the R180 is straight and should not be used with the R200. Note item #3 is the straight Rear Transverse LInk Mount of the 240-Z. 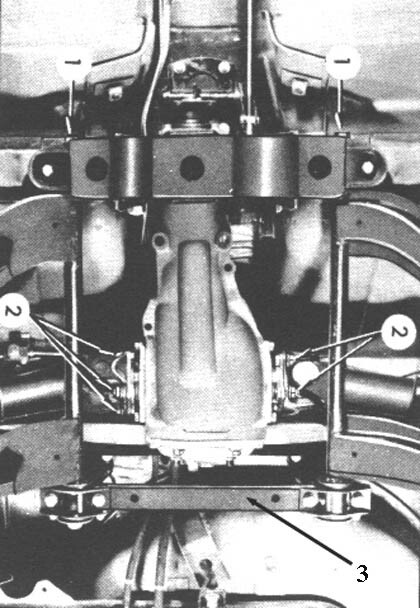 Note item ""A" shows a section of the Rear Transverse Link Mount of the 280Z, curved to go around the longer R200 rear end. Don't Forget: - the Transmission Speedo Gear to match the differential gear ratios. Speedometer gears in the transmission are made to match the rear differential gear ratio. If you are making this swap, be sure to grab the speedo gear out of the transmission of the donor car. Assuming the donor is a 280Z/280ZX - if the donor is a 300ZX then you'll need the correct gear out of a 280Z/280ZX. The R200 has a 200mm ring gear hence the designation (likewise the R180 has a 180mm ring gear). Nissan used this same differential although modified over time, in the Z Cars from 1975 through 1996. However some changes made to them during that period were minor and others of a more major nature. The R200 of the first and second generation Z Cars (280Z/280ZX) were for the most part the same and are therefore interchangeable on a direct bolt in basis. The R200 of the third generation Z's (84-89 300ZX) are also basically the same, but do have major differences that must be addressed, prior to retro fitting them to the earlier generations of Z Cars. The side output shafts (stub axles) have to be swapped with those of an R200 from the first or second generation cars. What Is Different Among / Between The R200's ? The 84 to 89 R200's used a ring gear bolted to the carrier with 12mm bolts vs. the 75-83 R200's which used 10mm bolts for that purpose. Thus the ring and pinion sets are not interchangeable between the two. Some of the R200's use stub axles (stub axles come out the side of the differential carrier) with bolt on flanges, which attach to the halfshafts (which Nissan calls driveshafts - side) that use universal joints. Some R200's use stub axles that are attached to CV Joints. You can pop the stub axles out of the differential carrier in each of these and swap them. About Swapping-out The R180 In The 240Z - For An R200 LSD From A 300ZX. You need the same mounting hardware described above. Plus you have to change the flanges and/or drive shaft input yoke. The R200's used in the 04/84-89 300ZX Turbo were equipped with Clutch Type Limited Slip Differential Units (check the Date of Manufacture on the car!). These rear end's are set up to run with CV joints. So to install one in your 240Z you have to remove the CV joint type stub axle and replace it with the stub axles with flanges that will match the flanges on your half shafts (what Nissan calls a "drive shaft -side" - we usually refer to as "half shafts"). This is a pull out/snap in operation. The input flange is another story however. You either have to change your drive shaft yoke to match the input shaft on the differential, or you have to change the input shaft on the differential to match the yoke on your stock drive shaft. Most people suggest that this is a job for a professional rear end shop. Because the internal parts to the rear end have to be removed and then reinstalled. (not something you want to mess up on). What Gear Ratio Is In This Differential? You do NOT have to count the teeth. Just turn the ring gear until you see two numbers separated by a slash ( / ) or colon ( : ). Simply divide the larger number by the smaller number and (tah dah!) you will have your final drive ratio. If you can't remove the rear cover - then you have to turn the wheels and count the driveshaft turns to determine the rear gear ratio. Use this method. As long as the tires are still the original aspect ratio, the speedo will be accurate, if the correct speedometer gear is used. Gearbox ratio's are irrelevant, only the tire size matters. Depending on which gearbox you are running, you might have to swap the speedo gear carrier - there are two types (clear anodized and black anodized), which have different offsets. The changeover point is when you go from 3.9:1 to 4.11:1 or visa versa.